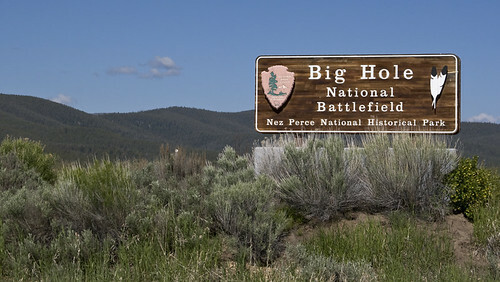 Big Hole National Battlefield | ¿Qué Onda Guero? After leaving the cabin in Stevensville, Karen and I traveled south on US-93 and then west on MT-43 to Big Hole National Battlefield. Big Hole is one of several battles that took place during the Nez Perce war of 1877. 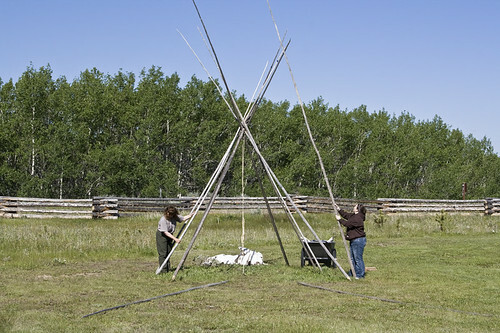 We got to the park just in time to see the tipi raising program. 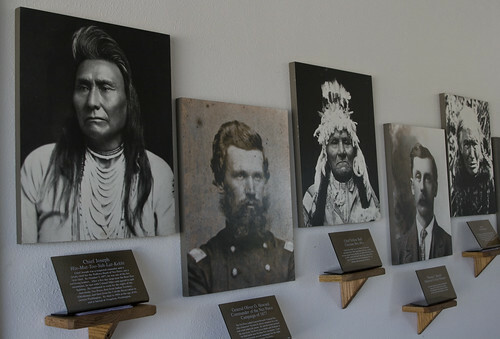 A temporary visitor center is setup at Big Hole because the permanent one is being renovated. Most of the artifacts are setup in a garage, and it’s a little cramped, but still very informative. 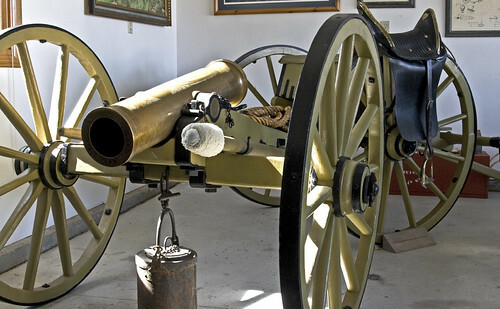 Shortly before midday on August 9, 1877, this mountain howitzer was brought into action on the hillside overlooking the battlefield. 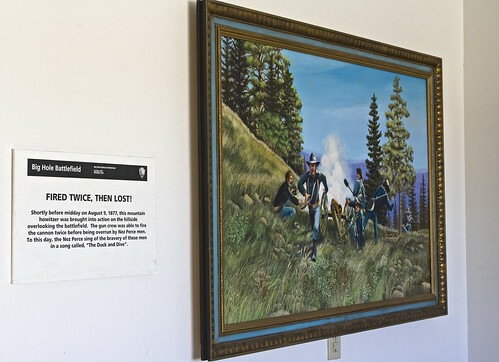 The gun crew was able to fire the cannon twice before being overrun by Nez Perce men. To this day, the Nez Perce sing of the bravery of these men in a song called, “The Duck and Dive”. Chief Joseph was a respected counselor and a treaty chief for the Wallowa Band of Nez Perce, not a war chief. By October 5, 1877, he was one of the few surviving leaders. After a five day siege near the Bear Paw mountains, he met with Colonel Miles and agreed to quit fighting. He continued to work for the rights of the non-treaty Nez Perce, first from Indian Territory (Oklahoma) and then from the Colville Reservation in eastern Washington. He died in 1904 at the age of 64, and is buried at Nespelem, Washington. The Nez Perce called General Howard “General Day-After-Tomorrow” because he always seemed to be a day and a half behind his enemy. 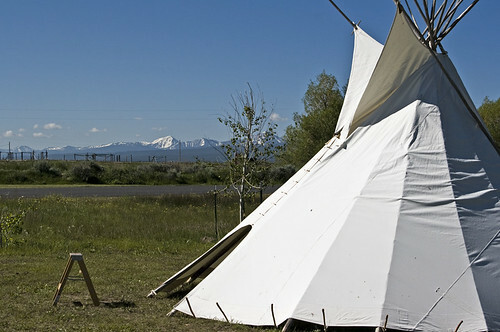 He and his troops pursued the non-treaty Nez Perce across Idaho and Montana to the final battle near the Bear Paw mountains. Later, Howard became an avid campaigner for the rights of the non-treaty Nez Perce. Chief Yellow Bull was a Nez Perce warrior and sub-chief of the White Bird Band. His son, a young warrior named Sarpsis Ilp-Ilp, was killed in the Siege area. In 1879, Yellow Bull and Chief Joseph spoke before the U.S. Supreme Court in Washington D.C. on behalf of the non-treaty Nez Perce. There’s a lot more to see and do at Big Hole, including hiking, which we didn’t do because of my knee problems, but it’s one of the places we would like to visit again the next time we’re out west. This entry was posted on Wednesday, July 21st, 2010 at 3:28 pm	and posted in Uncategorized. You can follow any responses to this entry through the RSS 2.0 feed.